Normally, Londoners would rather eat their own hands than engage with other Londoners - never mind dance with them. And while the people in the video, despite being described as the ‘great British public’ are probably actors, such is the rotund funny-man’s popularity, he would get away with it even if it wasn't part of a nationwide advertising campaign. And that's why this ad, created by Gravity Road, works so well. Let's face it, if an ordinary Joe performed a lip-sync of Estelle's hit Free on the streets of London while grabbing random women as they walked past they would be maced in the face quicker than you can mention the campaign hashtag '#freethejoy'. 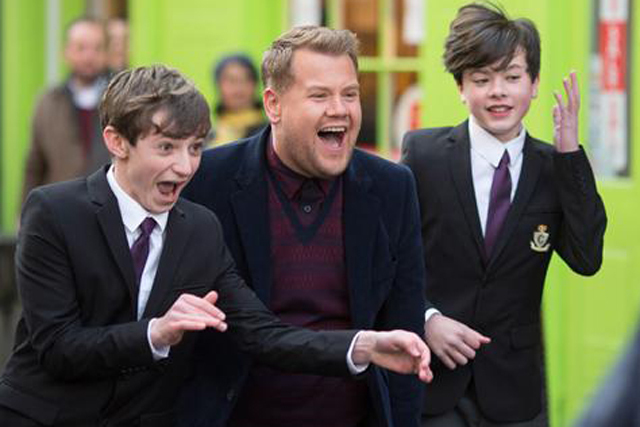 But with Corden it's believable, because, well, he's James Corden - and he comes bearing chocolate. Sure, it may be a damp and miserable day in the capital, but when you have someone many people regards as a national treasure jigging up to you with a song in his heart and a bar of chocolatey goodness in his clenched fist, it's hard to not crack a smile. True, Corden may not be everyone's cup of tea, but this ad has waltzed its way up the Unruly Viral Video Chart, attracting almost 3,000 shares and 270,000 views in its first 24 hours - and with good reason. Using celebrities in ads can be a very risky business. They are expensive and rarely drive online sharing. In fact, only 15 of the 100 most shared ads of all time feature celebrities, while only one (Jean Claude Van Damme in Volvo’s Epic Split) makes it into the top 20. That’s because star power will not drive sharing it on its own. They are only as good as the creative vehicle they have been given. Stick a star in a reasonably-priced car and they’re not necessarily going to race around a track any faster than anyone else behind the wheel (unless it’s Jenson Button or Lewis Hamilton, of course). However, in the case of ‘Corden's Ultimate Chocolate Lip-Sync’, the creative premise of the campaign uses Corden’s widespread likeability well and fits the star’s personality perfectly. So much so, it’s almost impossible to see this ad work without James Corden. The timing of the launch - just before The Brits, which Corden hosted for the fifth and last time this week - is also crucial.